Настоящая статья посвящена вопросам, связанным с защитой морской среды в турецких водах. Особое внимание уделяется ответственности за загрязнение в форме административного штрафа, причем в удобно табличной форме приводятся сведения о размерах штрафа в 2015 году. В частности, рассматриваются вопросы о размерах штрафа, способах его обжалования, а также даются рекомендации по действиям во избежание штрафных санкций. “It is prohibited, to introduce into, store in, transport to or remove from the receptor area any discharge or waste in such a way as to inflict damage on the environment or in a way directly or indirectly in contradiction with the standards and methods specified in the pertinent regulations, or to engage in similar activities”. This provision is widely interpreted and rigorously enforced, to the extent that vessels have even been fined for pumping out clean ballast water. Ships at anchor off Istanbul are monitored particularly closely. Fines are imposed in accordance with a published tariff, shown below, which is revised annually. The amount of the fine is determined by the size of the vessel and the type of pollutant, rather than the quantity of pollutant alledged to have been discharged. In almost all cases the fine must be paid in cash. The amount may be reduced by 25% if settled immediately to allow the vessel to sail. Payment of the fine is not considered an admission of liability, and an appeal may still subsequently be lodged. In exceptional circumstances the authorities may accept banker’s drafts or financial guarantees, but this is unusual and will lead to additional delays to the vessel while the original guarantee and notarised official translation are arranged and delivered to the authorities. The current exchange rate is approximately 2.70 Turkish Lira (TRY) to the USD. A second or third offence in a three year period results in the fine being doubled or tripled respectively. In the case of dangerous goods, the fine is calculated by multiplying the applicable Category C rate by ten. 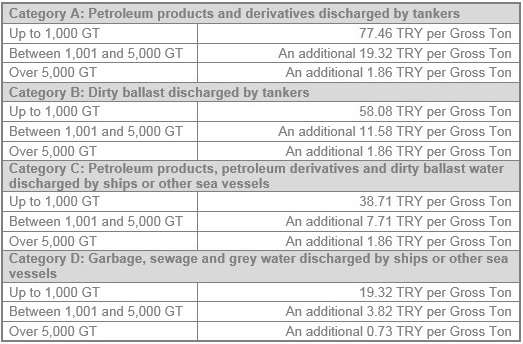 In the event of a vessel being fined and detained for an alleged pollution incident in Turkish waters, the local P&I correspondent should be contacted immediately for assistance. It is important to note that the authorities do not need to substantiate their allegations and it is up to the ship to prove otherwise, making pollution fines in Turkey very difficult to challenge. Shipowners may appeal to the Administrative Court within 30 days of a fine being notified. However, the chances of a successful appeal are limited. Providing the authorities with evidence of best practice and comprehensive prevention measures will not mitigate a fine even if the vessel maintains that another ship was responsible. In such cases photographic or video evidence taken at the time of the incident might help, but this is by no means certain. If a vessel is under repair in a Turkish shipyard or dry dock and pollution is caused by the negligence of the shipyard’s employees or agents, the ship may still be fined. In the event of such a pollution incident occurring a Letter of Protest should immediately be issued to the shipyard. • As far as is safe and practicable, deballasting operations should be avoided. In any event only clean ballast water should be discharged. • Overboard discharge valves should be closed and sealed shut. • All deck scuppers should be plugged and sealed, and any gaps in the fish plate surrounding the deck should be closed. • Hatch covers should not be hose tested. • Fire hoses should not be pressure tested. • Fixed fire-fighting monitors, sprinklers and drenching systems should not be tested. • The vessel’s decks and superstructure should not be washed down. • Treated water from the sewage system should be transferred to a holding tank and should not be discharged until the vessel is clear of Turkish waters. • Grey water from sources such as the galley, laundry and bathrooms should be retained on board in a similar manner. • Steps should be taken to prevent cargo residues, incinerator ash, garbage, cleaning agents and other substances that may be construed as being pollutants from reaching the water. • The vessel’s hull should not be scraped, chipped or painted while alongside or at anchor.